This CD is a collection of 12 original compositions, many with exotic keyboard and blended vocal ensemble effects. Antoine Bleck has a soft-spoken singing style, never overwhelming the music, always enhancing its mood and moment. His native French and occasional English lyrics range from blues ("Un Blues Français"), to paternal ("Sophie's Song"), to urban ("Central Park"). 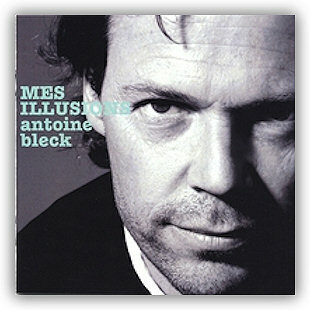 Antoine Bleck sings, speaks, whispers, and plays a rambunctious piano, evoking the vocal style of Yves Montand. All music composed by Antoine Bleck, lyrics by Antoine Bleck and CharElie. #1 – Mes Illusions -- This introductory carefree track has vivacious rhythms and a retro French musical sound. Bleck sings with captivating flare, breezy and sunny, and the piano blends seamlessly with keyboard, guitar, and drums. This music is refreshing and innovative in its European inspirations. #3 – French Tuesdays – David Silliman's percussion is featured here in a syncopated track that should be used in every dance studio (hustle comes to mind). The beat is fixed and persistent, and hearing this track makes you want to move with the music. The vocal ensemble creates a capricious backdrop to Bleck's spoken lyrics, like the sound track of a film. #9 – Opia Sky – Antoine Bleck's NY restaurant, Opia, is referenced here. This New Age-infused music, with Silliman's percussion, Dombrance's guitar, and Bleck's piano, keyboard, and understated lyrics, is smooth, sultry, and state-of-the-art. In fact, this track is mesmerizing, with nurturing, nuanced intonations. #10 – Central Park – This was my favorite track with natural voices for atmospheric sound, with echoing vocal ensemble ambiance, and with Bleck's spoken French monologue, so reminiscent of retro Nouvelle Vague films. This is a sophisticated, mature, and artistic take on a walk in the Park.